Charles Darwin: "There seems to be a sort of fatality in my mind leading me to put at first my statement or proposition in a wrong or awkward form." Charles Darwin: "With such moderate abilities as I possess, it is truly surprising that I should have influenced to a considerable extent the belief of scientific men on some important points." 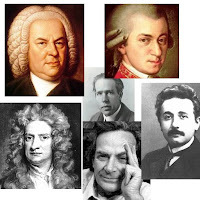 ‎Richard Feynman: "I was born not knowing and have had only a little time to change that here and there"
Wolfgang Amadeus Mozart: ‎"People make a great mistake who think that my art has come easily to me"
Albert Einstein: "You ask me if I keep a notebook to record my great ideas. I’ve only ever had one…"
Albert Einstein (about his own theory): "Let no one suppose that the mighty work of Newton can really be superseded by this or any other theory. His great and lucid ideas will retain their unique significance for all time as the foundation of our whole modern conceptual structure in the sphere of natural philosophy." Niels Bohr: "Everything I say must be understood not as an affirmation but as a question." Questions: do you know any more examples of modest quotes by geniuses? Do you know a genius who said some very immodest things?